Is your style of love filled with angel wings and harp music, or do you like to be just a little wicked? 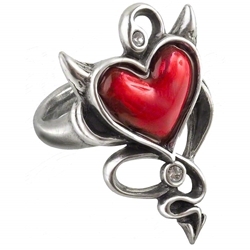 The Devil Heart Ring displays a bright red enamel heart with silvery, pointed horns and a twining, forked tail. Swarovski crystals add extra glitter to the gothic jewelry, appearing above and below the heart. Crafted from the finest English pewter, this delightful enamel ring displays an impish twist on the usual heart jewelry, offering a charming gothic accessory for a romantic get-away or any time of year when you are feeling just a little bit mischievous! This heart ring looks fabulous with the Heart Earrings (Item 17-ULFE22) and Heart Hair Screw (17-ULFHSC1).